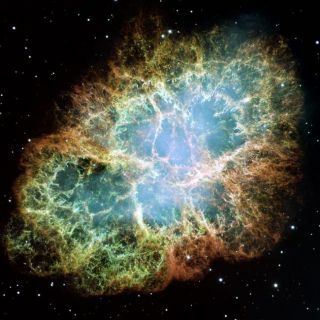 The glowing Crab Nebula, a spectacular and colorful objectfamously imaged by the Hubble Space Telescope, represents the leftovers from asupernova explosion observed by Chinese and Arab astronomers in 1054 C.E. Thestar that exploded is still there, but now in the form of a dense, spinningpulsar that emits lighthouse beams of radiation. Now scientists have discovered high-energy gamma rays nearthe pulsar that oscillate in alignment with the star's spin. The finding mayshed light on the intense environment deep inside the CrabNebula. When it died, the star that created the Crab Nebula had runout of fuel to power nuclear reactions, so it collapsed under its own gravityinto the condensed form of a neutron star (these are made only of neutrons ? noprotons or electrons). The explosion pushed out the star's outer layers to formthe gassy nebula visible to telescopes today. The neutron star is called apulsar because of the pulses of light we see when it spins, and it's encircledby a swirling web of speeding particles and electromagnetic fields. "Mainly, we are trying to understand the magneticfields around the pulsar and the emission mechanisms that are making thepulsars pulse," said researcher David J. Clark, an astrophysicist at theUniversity of Southampton in the U.K. "The gamma rays we found are beingproduced by this cloud of high speed particles circling around thepulsar." The researchers, led by Anthony Dean of the University ofSouthampton, found that the gammarays are polarized, meaning their electric fields move up and down in onedirection, which happens to be in the same direction as the axis of thepulsar's spin. This tells the scientists that the light is produced close tothe pulsar. The study, funded by the Italian Space Agency and the U.K.'sScience and Technology Funding Council, is detailed in the Aug. 29 issue of thejournal Science. The discovery is "yielding insights into the processesand mechanisms involved in making a dead star so active," wrote AnnalisaCelotti in a commentary article in the same issue of Science. She is anastrophysicist at the International School for Advanced Studies in Italy, who wasnot involved in the research. "The high degree and direction ofpolarization at high energies reported by Dean et al. provide valuableinformation on the site of acceleration of the particles and on the structureof the magnetic field associated with the pulsar." Learning more about the Crab Nebula system helps scientistunravel the complicated workings of pulsars ingeneral. The Crab, located about 6,500 light-years from Earth in theconstellation Taurus, is the brightest pulsar around, so it's the easiest tostudy. "This is the brightest object in the gamma ray sky, theone we have the most data for," Clark told SPACE.com. "Theimportant thing we were trying to do in the first place is actually measurepolarization, because people haven't been able to measure polarization to agood degree of accuracy before." The recent measurements came thanks to the European SpaceAgency's International Gamma-Ray Astrophysics Laboratory satellite, whichobserves the gamma-ray sky.